"... MFU System is certainly helping distributors who are using it, concentrate more on their business than handling logistics of executing mutual fund transactions and glad that it has opened up a lot of opportunities for IFAs to increase productivity levels. Especially the TransactEezz facility which is now opened for clients, has virtually helped us go completely paperless in real sense. This has virtually eliminated the need of stacking multiple AMC forms and service requests at our end. For any new clients or existing for that matter we always insist on opening a CAN as I certainly believe that although it’s a onetime activity in terms of paperwork but then it has more advantages than one." "I find TransactEezz feature of the MFU platform for forwarding MF transactions extremely convenient, useful and timesaving. It saves lot of my time and energy. I need not go to investors to collect forms and cheques. If any investor is shy of netbanking facility provided by his bank he can even go to his bank and approve the transaction through NEFT/RTGS within 24 hours. Order book is also separately provided for lumpsum as well as systematic transactions. My investor can send their orders over phone or email. Transactions for multiple folios or MF schemes across the participating AMCs are possible. Executives of MFU are also vefy friendly and co-operative in nature. They attend any queries anytime and keep vigorous follow ups with AMCs for our queries until they are resolved ." 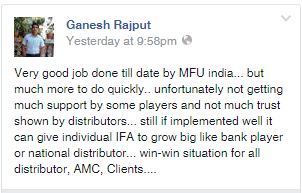 "I am using MFU for last six months. The service is marvelous and the support which i get is fabulous. i have shifted roughly 50% percent of my existing business to MFU. They are good because they exist only for the mutual fund industry." "... I have been using both the systems NSE & MFU.... MFU though a slow starter but is making steady progress... Their staff and support system is very good and responsive... I am now totally concentrating on MFU and getting all my clients on board MFU... Especially after the latest feature of 100% paperless transactions the system is very robust... Yes there are teething troubles with MFU also... BUT the entire team understands the business very well and any errors are reversed / rectified by them "WITHOUT ANY LOSS TO THE CLIENT" which is a BIG difference. My suggestion is to seriously take a look at the MFU System it is transforming and evolving fast." "... Simultaneously I have been using the MFU system too... I am pretty happy with their response mechanisms... ... I am now completely moving to MFU now." "... What I like most about MFU is the fact that it has got a very dedicated team. I get instant reply to the queries I raise. … The facilities that MFU is offering- the Payeezz and transacteezz facilities are the future of MF Industry. I believe that is how MF transactions will take place in future and I am glad that I am using these facilities right from the day these facilities were launched … The level of automation-It is really amazing how much efforts these people have taken, how small details they have taken in to account and how much easy they have made the platform before launching- things like folio based transactions, automatic cropping and uploading of investor signature are examples of how much care MFU has taken to make it simple for distributors. … Query, Complaint and feedback module- no matter what problem I am facing, if I post my query, feedback suggestion or complaint I always get reply within 24 hours!! ... "
"I really appreciate the work done by MF Utility to bring many AMC's under one roof. And I can understand how tough it must have been for you and your team, to bring the MFU platform where it is today. It gives out a strong signal that the MF Utility is with the distributor fraternity and its best to lower the financial burden of the distributors through online platform which will further help, making the transactions easy and paperless. This will boost IFA's business. It's easy for the investors to process the transactions within the time limit." "It is a very good initiative taken by MFU free of Cost or without any deposit. I am using it, it's a hassle free, convenient, paper less, cost efficient, time saving latest technology adopted by MFU. One can do all the transactions across the AMC with only one Login and Password. No need to submit hard copy to RTA. No signature mismatch. No need to keep records of approval separately.Only submission of One Time Mandate to MFU will serve the requirement of purchase either Lump Sum or SIP across the AMC, no need to submit OTM to each AMC. Approval from investor may be obtained through all the Mode i.e by email, SMS, Phone, Fax etc. My sincere thanks and gratitude to entire MFU Team. All the Distributors should use the this innovative platform and enhance their reach to investor and increase the volume of business." "At the outset, my sincere thanks to you and to your splendid team – I would like to thank Team MFU who went all out of his way to help and save my day on 10.08.15. I must conclude, using MF Utility platform has been a wonderful experience for me and it’s just a beginning. I have actively started telling my IFA colleagues about the many advantages available to us IFA’s from your platform. 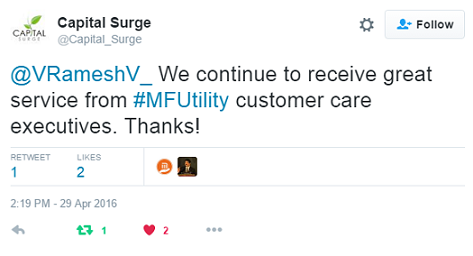 I do hope this high level of service and commitment from MFU continues for mutual growth."